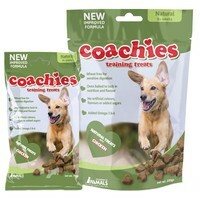 Coachies Naturals are tasty training treat that your dog will definitely approve of. Containing glucosamine, MSM and chondroitin, this low carbohydrate formula helps promote healthy joints and the green tea extract provides natural antioxidants. Coachies naturals are also cereal free and contain a highly digestible source of protein. These delicious treats can be gives as a treat or reward. These temptingly tasty chicken flavoured treats are 100% healthy. Great, tasty treat, fit well into treat dispensers to keep my dogs entertained and interested. Very good treats, ideal for training as they are tiny, I can use lots without being worried about my dog putting weight on. These are great treats for training. I have a collie cross and he loves the treats. The treats are small, so I can use more than I could with other treats.